Two pregnant women forge an unlikely friendship which forever alters their far-from-perfect lives. 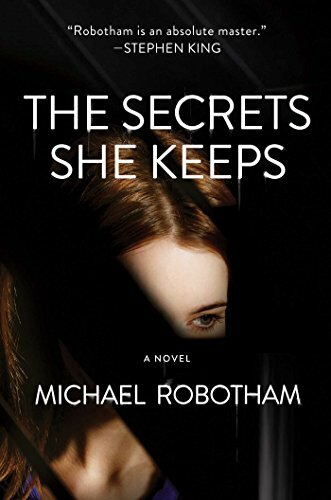 With The Secrets She Keeps, crime writer Michael Robotham delivers a riveting story of escalating unease. One woman—Agatha—watches mommy blogger Meg from the grocery store from which she works, coveting Meg’s seemingly perfect life from afar. Meg is beautiful, lives in the perfect home with a good-looking husband and their two (soon to be three) charming children. She lives a thrilling life on the go, punctuated by coffee dates with stylish pre-school moms, all humorously captured on her popular blog. In contrast, Agatha’s survived a life sharpened by heartbreak, works in a low-paying job and barely affords to pay her run-down apartment. But everything is about to change. She’s pregnant and in love, and soon, her navy boyfriend is coming home. One day, Meg walks into the grocery store and Agatha musters the courage to talk to her. Agatha learns both she and Meg are due the same month and a new friendship takes root. Agatha’s life begins to look up. Soon, we discover the secrets they both keep as the veneer of perfection fractures and darker, dangerous truths come to light. Worse yet, something happens, something shocking and irreversible that forces secrets to be bared, and the proverbial clock begins to tick for both Agatha and Meg. What’s truly impressive, is how Robotham gradually and almost inconsequentially reveals deeply distressing truths as part of a narrative that continues to unravel. Just when you think all the secrets are out, there’s more. And it’s this resulting, ratcheting tension that keeps you turning the pages, anxious to see how this sinister tale will end, how the very different lives of two women intersect and persist after the unimaginable occurs.